Dr. Benson's practice emphasis is on treatment of glaucoma, diabetic eye dises, macular degeneration, dry eye, and other eye problems in addition to providing quality eye care to all ages. Dr. Benson is both types of eye doctors: Optometrist AND Ophthalmologist. Practicing with the motto, "Caring for you, not just your eyes," he has been attending to his patients for more than 25 years. Why should I see an ophthalmologist? How often should I see an ophthalmologist? Get these answers and more. Normally, the eye constantly bathes itself in tears. By producing tears at a slow and steady rate, the eye stays moist and comfortable. Sometimes people do not produce enough tears or the appropriate quality of tears to keep their eyes healthy and comfortable. This condition is known as dry eye. The eye uses two different methods to produce tears. It can make tears at a slow, steady rate to maintain normal eye lubrication. It can also produce large quantities of tears in response to eye irritation or emotion. When a foreign body or dryness irritates the eye, or when a person cries, excessive tearing occurs. discomfort when wearing contact lenses. Excess tearing from “dry eye” may sound illogical, but it can be understood as the eye’s response to discomfort. If the tears responsible for maintaining lubrication do not keep the eye wet enough, the eye becomes irritated. Eye irritation prompts the gland that makes tears (called the lacrimal gland) to release a large volume of tears, overwhelming the tear drainage system. These excess tears then overflow from your eye. 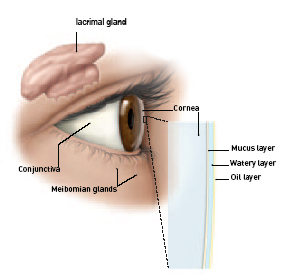 The oily layer, produced by the meibomian glands, forms the outermost surface of the tear film. Its main purpose is to smooth the tear surface and reduce evaporation of tears. The middle watery layer makes up most of what we ordinarily think of as tears. This layer, produced by the lacrimal gland, cleanses the eye and washes away foreign particles or irritants. The inner layer consists of mucus produced by the conjunctiva. Mucus allows the watery layer to spread evenly over the surface of the eye and helps the eye remain moist. Without mucus, tears would not stick to the eye. Since these medications are often necessary, the dry eye condition may have to be tolerated or treated with eyedrops called artificial tears. People with dry eye are often more prone to the toxic side effects of eye medications, including artificial tears. For example, the preservatives in certain eyedrops and artificial tear preparations can irritate the eye. These people may need special preservative-free artificial tears. An ophthalmologist is usually able to diagnose dry eye by examining the eyes. Sometimes tests that measure tear production are necessary. One test, called the Schirmer tear test, involves placing filter-paper strips under the lower eyelids to measure the rate of tear production under various conditions. Another test uses a diagnostic drop (called fluorescein or rose bengal) to look for certain patterns of dryness on the surface of the eye. Eyedrops called artificial tears are similar to your own tears. They lubricate the eyes and help maintain moisture. Artificial tears are available without a prescription. There are many brands on the market, so you may want to try several to find the one you like best. Preservative-free eyedrops are available for people who are sensitive to the preservatives in artificial tears. If you need to use artificial tears more than every two hours, preservative free brands may be better for you. You can use the artificial tears as often as necessary-once or twice a day or as often as several times an hour. Conserving your eyes’ own tears is another approach to keeping the eyes moist. Tears drain out of the eye through a small channel into the nose (which is why your nose runs when you cry). Your ophthalmologist may close these channels either temporarily or permanently. The closure conserves your own tears and makes artificial tears last longer. Tears evaporate like any other liquid. You can take steps to prevent evaporation. In winter, when indoor heating is in use, a humidifier or a pan of water on the radiator adds moisture to dry air. Wrap-around glasses may reduce the drying effect of the wind, but you should note that they are illegal to wear while driving in some states. A person with dry eye should avoid anything that may cause dryness, such as an overly warm room, hair dryers, or wind. Smoking is especially bothersome. Some people with dry eye complain of “scratchy eyes” when they wake up. This symptom can be treated by using an artificial tear ointment or thick eyedrops at bedtime. Use the smallest amount of ointment necessary for comfort, since the ointment can cause your vision to blur. Dry eye due to a lack of vitamin A in the diet is rare in the United States but is more common in poorer countries, especially among children. Ointments containing vitamin A can help dry eye if it is caused by unusual conditions such as Stevens-Johnson syndrome or pemphigoid. Vitamin A supplements do not seem to help people with ordinary dry eye.